Is there a famous recipe at your house? A recipe that your family begs for? There sure is at mine and I’m happy to share it with you! My grandma and my mother (who was a converted Southerner from New Jersey) could make skillet cornbread like nobody’s business. Alas, it’s a skill that I never perfected. Try as I might, mine just never tasted as good as my mom’s and my grandma’s version. I know – so sad. As a young bride though, my mother-in-law introduced me to her recipe and I’ve been making it ever since. Nothing compares with the comfort of my childhood cornbread memories, but the taste of this cornbread surely ties for first place. It is a little bit sweet, moist and so delicious. My family loves it and so do I! 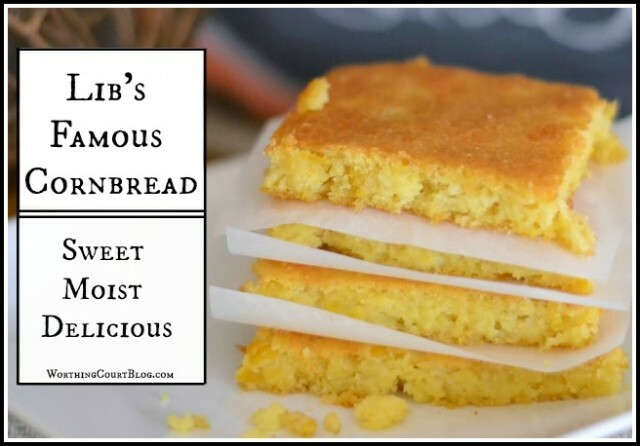 A slightly sweet, moist and delicious cornbread recipe. In a medium mixing bowl, slightly beat the 3 eggs. Add the remaining ingredients and stir by hand until well blended. Do not use a mixer. Lightly coat a baking sheet with 1" sides with nonstick spray. Pour batter into the baking sheet and bake for approximately 40 minutes or until golden brown. The leftovers freeze well. 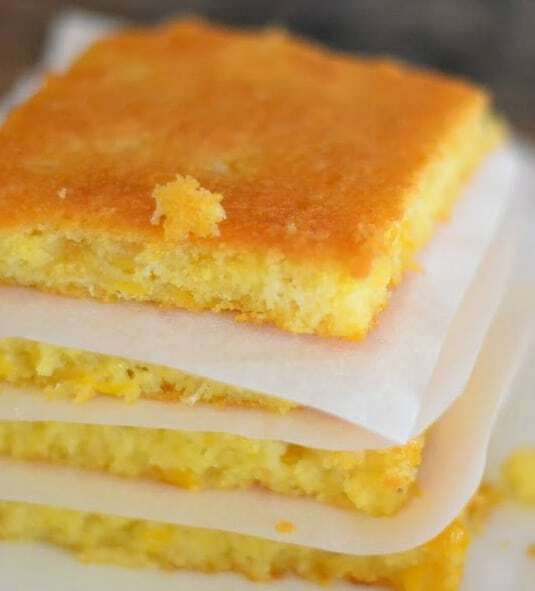 Allow the cornbread to cool completely before placing the squares into a freezer bag. When ready to reheat, remove the desired number of squares from the freezer bag and allow to thaw. When thawed, wrap the squares in a slightly moistened paper towel and microwave until the desired level of warmness is reached. I recommend a setting of no higher than 70% power on your microwave. Wrapping the cornbread squares in a moistened paper towel will prevent the cornbread from drying out and hardening when microwaving. You can’t beat a recipe that is so easy to make and will feed a crowd! It’s a perfect accompaniment to any dish. And it’s especially perfect with a nice steamy bowl of chili! 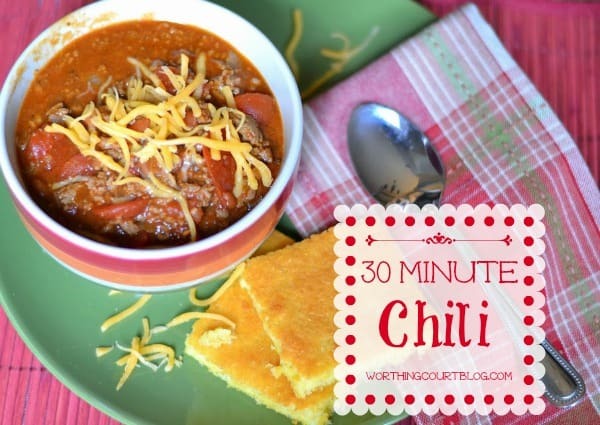 Click HERE to get my tasty and quick 30 minute chili recipe. So tell me, do you have any cornbread memories? 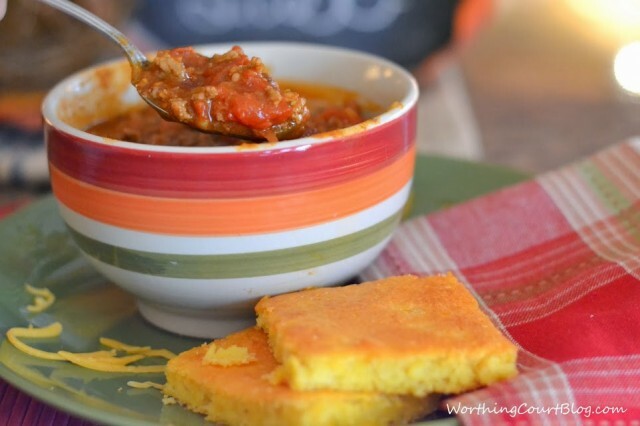 How about a favorite meal that you like to eat cornbread with? « 11 Steps To A Cozy Room – No Fireplace Needed! We love cornbread, too. My family fried cornbread, and I loved it. My daddy would slice each patty as my mother took it out of the frying pan and place a slice of sharp Cheddar cheese in it. Oh my, it is so good. Basically it is cornmeal, salt and pepper and water. I like just a tiny bit of finely minced onion in my mix. You just add the water until you get the right consistency to spoon into the frying pan. You want your pan a medium heat with a very shallow bit of oil. I use canola. I will have to make some and take photos one day soon. I was waiting for this cornbread recipe. It sounds great and I will have to give it a try. This would be great for a crowd and would surely please most. I bake the old fashioned cornbread baked in an iron skillet. I have been known to add “cracklin’s”, corn, onions, cheese,hot peppers and a little salsa. Not all together except the latter three. I truly love “cracklin’ corn bread. Tell Shirley that I too love my cornbread crumbled into buttermilk, Bob loves his with “sweet milk”. Does anyone remember it being called “sweet milk”? My recipe varies from the cream corn, honey and even jalapeno’s but I have never used sour creme. I bet that makes it a lot more moist. I am book marking this recipe and will be trying it. Visiting from Foodie Fridays. 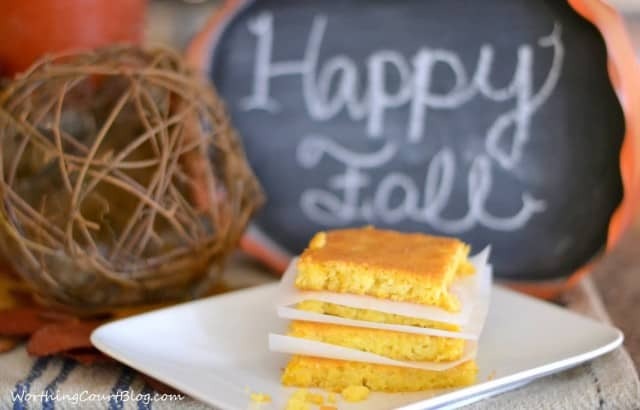 Your cornbread is the #1 Most Viewed Recipe at Foodie Friday this Saturday morning. It looks absolutely fabulous! I am always on the lookout for the PERFECT cornbread. I can’t wait to try this! Suzy………..love your blog and decorating talent and I love “the beach” as you do but unfortunately live inland in Alabama and the closest coast is 4.5 hours away at Panama City Beach, FL. Your cornbread recipe calls for a sheet pan with 1″ sides. Can you tell me the size of the pan as they vary so much? Thank you and keep the “good stuff” coming! Hi Linda. You aren’t too much farther from the beach than we are. It takes us about 4 hours to get there from our house. 🙁 I’ve never been to Panama City, but would love to visit there one day! Good question about the pan size. The one that I usually use is about 10″ x 15″. I’ve used a larger one, but of course that impacts the thickness of the cornbread and the cooking time a bit. I’ve had your cornbread and it is AWESOME!! I started adding sliced pickeled jalapeños and shredded cheddar on top and cook it in my cast iron skillet so mine’s a little thicker. I guess this would be considered a “southern” Mexican cornbread LOL. I think of you every time I make it ?